So we have recently been working on the Vision and Mission for Blnd. This is a short post on how we did it – with a first picture for the site too! First, we defined what we wanted from the Vision and Mission…. What are our hopes and dreams? What are we solving for who? Is there a greater good? How do we serve them? It was then time for us to have a look at some examples for inspiration, and we looked at companies from Alibaba to Zoopla, IKEA to Tesla, even MoMA! 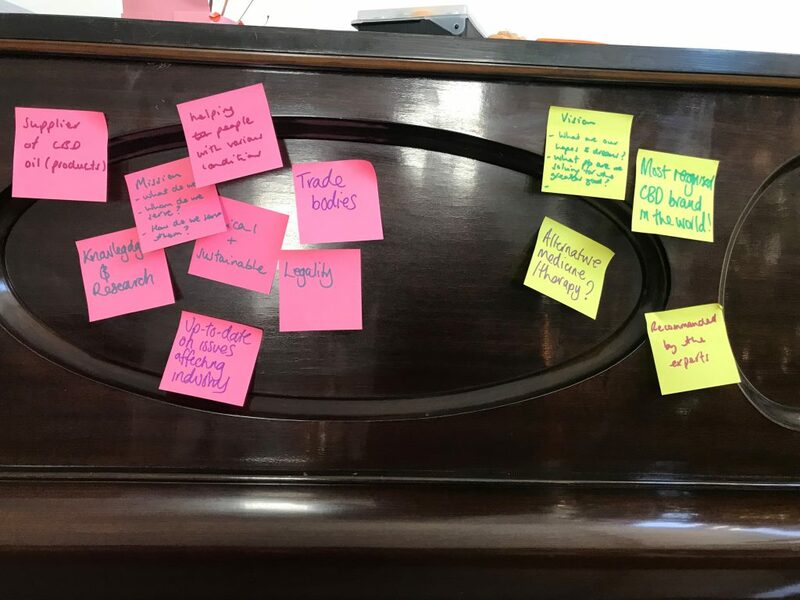 Next, we got some post-its and over the course of a few days stuck our thoughts and ideas on the piano (see lovely picture above). Then, we sat down together and tried to but the above thoughts into some coherent statements. Below is the result and the first go at our Blnd Vision and Mission! It feels good now that we have some direction. Hey – we are back! So…..time for a little more info. My wife and I are attempting to set up a CBD oil business, and whilst we are doing all the necessary research and set-up of countless other aspects, we wanted to document it all here and start to build the presence of our site! (I hear this is advisable for any new site). So, we will post updates and share them through social media. We hope you like them and find them useful, and we hope you become our customers one day! Today is the day! The first post on the blnd blog! My wife, Marie-Helene, and I have decided to try and build a new business. We thought we’d bring whoever wants to come on this journey with us. Hooray I hear you shout! We plan to document all of our key decisions and learnings right here on the blog, and this may eventually turn into our site! We promise to be back soon with a bit more detail on the steps we have completed so far…….